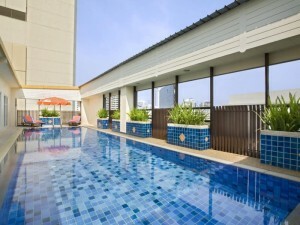 Citadines Sukhumvit 16 is a three star hotel on Sukhumvit Soi 16, a quiet soi located a short distance from Asoke BTS station and Terminal 21 shopping mall. 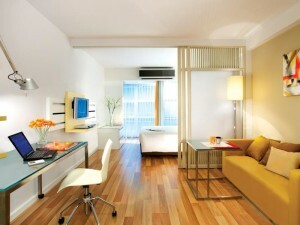 The hotel has 79 spacious and modern rooms, all of which have work desks and large, comfortable beds. Many of the hotel rooms receive daytime sun, making them feel spacious and more comfortable. The hotel has an outdoor pool and fitness center with free weights. From the hotel, it takes about five minutes to walk to Asoke BTS station and seven minutes to walk to Soi Cowboy.